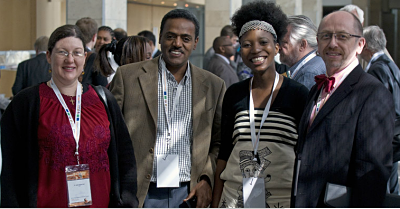 The 4th Euro-Africa Cooperation Forum on ICT Research was held at the Cape Town International Conference Centre from the 14th to the 15th of November 2011. This event was hosted by the Government of South Africa, through the Department of Science and Technology and organised by the EuroAfrica-ICT initiative and CSIR. Sibukele Gumbo, Project Lead of the Siyakhula Living Lab Management Unit, was invited to present in the panel session “Africa-EU Cooperation on Open Living Labs (local innovation and technology transfer): Status and Perspectives”. Her presentation, entitled “The Siyakhula Living Lab and the COFISA and SAFIPA programmes : Learnings and Perspectives”, was well received by the delegates and can be viewed on the following link. Additional details about the event, proceedings and photographs are available at the Euro-Africa website.